Fans of He-Man have not been thrilled with the way things have gone in trying to make a new movie based on the powerful prince hero these past few years. Nevertheless, studios keep on trying, and Columbia Pictures has hired Mike Finch and Alex Litvak to write a shiny new script for Masters of the Universe. A new, re-envisioned take on the He-Man character using modern filmmaking technologies has been floating in purgatory for quite a while now. At one point we even had a script that was getting great feedback and being compared to The Lord of the Rings as well as Kung-Fu Panda co-director John Stevenson set to captain the movie, but alas, even that was killed, revived, and killed again within the gears of the Hollywood machine. Finch and Litvak are currently making a name for themselves as the writers behind Robert Rodriguez’s Predators, and they have other noted projects on the horizon such as Medieval, which they both worked on, and the latest retelling of The Three Musketeers, which Litvak was part of. The only concern now is where they are going to go with this. When Justin Marks wrote the script for Warner Brothers, the result was the above-mentioned script which sounded perfect. 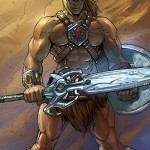 The problem was that Mattel, the toy company behind He-Man, had to approve. They did not approve, and so Warner Bros. had to drop the project and move on. When Mr. Finch and Mr. Litvak are done, Mattel will once again have to approve before Columbia can move forward with directors, actors, and all of that good stuff. So was this previous attempt by WB just not good enough despite the script’s praise, or is this Mattel complication going to be the single fatal reason that Masters of the Universe will not be as good as it should have been?